After folding a few origami pineapples from different creators, I found out this one, that became my favorite one. It's a modular construction, that starts by folding 6 rings, that are then glued together (sorry!, not for purists). The leaves are then inserted on the top. The whole process it's a little time consuming, as it consists of several modules, but the modules are very easy to fold and assemble, and the final model looks really nice. 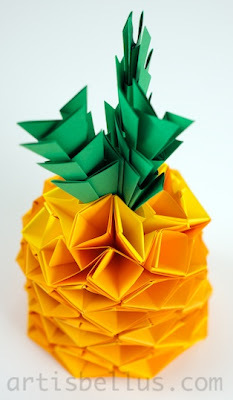 The origami pineapple was created by Kumasaka Hiroshi. 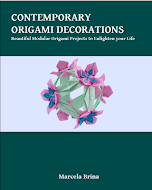 The diagrams can be found in the book, Doctor's Origami Dream Book, ISBN 9784255003788, by Toshikazu Kawasaki. I folded the pineapple with a total of 63 squares of paper: 48 of different shades of orange, 8 yellow, and 9 green. 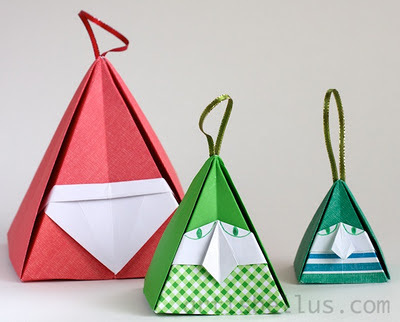 I used Note Cube paper, which is copy paper that already has been cut into 3 ½" (90 mm) squares, which is very convenient for origami modulars.